UNCANNY X-MEN #14 is an extremely satisfying read for anyone who's ever enjoyed an X-Men comic. Matthew Rosenberg is a treasure X-Men fans should cherish. 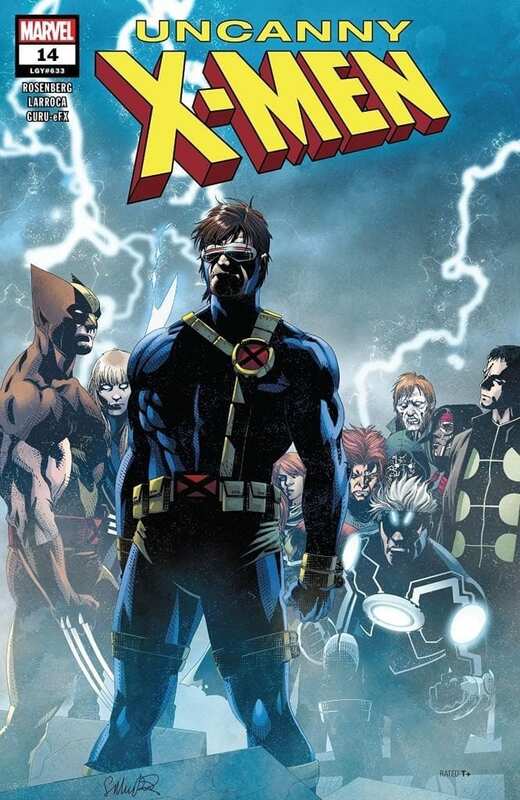 Scott Summers and Logan band together the remaining mutants untouched by Age Of X-Man. Writer Matthew Rosenberg reaches new heights in UNCANNY X-MEN #14. Most of the mutant population is gone, presumed dead, thanks to the wonderful Age Of X-Man story. The mutants left behind, led by returning leaders Cyclops and Wolverine, are taking care of business in the shadows. Scott Summers has a list of chores for his X-Men to complete, which takes them on a tour of who else is left. We play catch-up with a lot of characters we haven’t seen in a while, like Chamber and the Morlocks. Scott’s laundry list of shadow tasks catches the attention of Captain America once international robot explosions are involved. The massive chunk of missing mutants actually does Matthew Rosenberg a favor. The preceding “X-Men: Disassembled” story featured every possible mutant they could fit on the page. Downsizing the roster gives Rosenberg a chance to do what he does best, injecting all the personality that comes with his writing in quick, subtle moments. What’s different this time around is how epic and serious this story is up front with all the quirky, silly character moments littered throughout. Rosenberg has an already impressive portfolio of comic books, but his work with mutants is proving to be his strongest. He has a perfect tone and deployment for seemingly every character. Scott, Logan and their team being an underground operation, shying away from the public eye adds to the suspense every step of the way. It’s extremely satisfying to not only have Scott and Logan back at the forefront of X-Men comics, but have them in such a punk rock manner. It’s important that character resurrections matter in comic books (since they happen so often) and Rosenberg makes this feel extremely important and highly entertaining. It’s not just the two big guns either, having other fan favorites (such as Magik, Madrox, Chamber, etc.) playing a big part makes this epic climb even higher. It also helps when artist Salvador Larroca is on fire as well. Uncanny X-Men #14 feels like the opening chapter to a dark, edgy action movie. Each set piece and location matters and has a distinct feel. Larroca brings the script to life with urgency and grandiose. It’s refreshing to see Larroca away from the photo-reference style of his Star Wars work. Larroca, along with colorist Guru-eFX, bring our favorite mutants back in their classic outfits as well. The slightly modernized takes on Cyclops, Wolverine, and the New Mutants costumes add an extra layer of nostalgia and excitement. It’s just slapping an old coat of paint for easy fan fair, it matters that these characters are wearing these outfits and they look damn good doing it. Uncanny X-Men #14 is a stellar chapter in Matthew Rosenberg’s mutant resurgence. X-Men comics matter again with issues like this (and Age Of X-Man). This story will satisfy old school fans hungry for a return to form and those getting their first taste of Cyclops and Wolverine at the forefront. Personally, I can’t wait to see what Rosenberg does with the dynamic of Scott and Logan. They’ve been at odds for so long but really don’t have a reason to be anymore. So much has changed for mutants as a whole and these two men. We’re in good hands as we enter into another exciting chapter in the longstanding X-Men continuity.